One of the announcements at Microsoft’s Build event in Seattle was Remote Assist, an application for the HoloLens augmented reality headset. Today I got an opportunity to try this out, and was impressed. The company has set up a hotel room as a factory with some big machines that whir and hum and a scary power supply cabinet. I took the part of the engineer when a fault stops the machines and the factory grinds to a halt. Unfortunately I knew nothing about how to fix it. The solution was to put on the HoloLens headset and make a call to someone better informed. The concept is pretty simple. The remote technician sees what you see, so can easily inspect the screens as well as the physical state of the machinery. 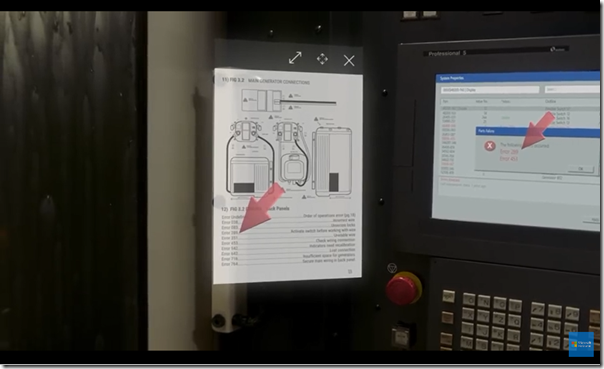 Along with the video call, HoloLens and Remote Assist lets the remote technician add annotations to the real world, pinpointing the exact button, cable or belt that needs attention. 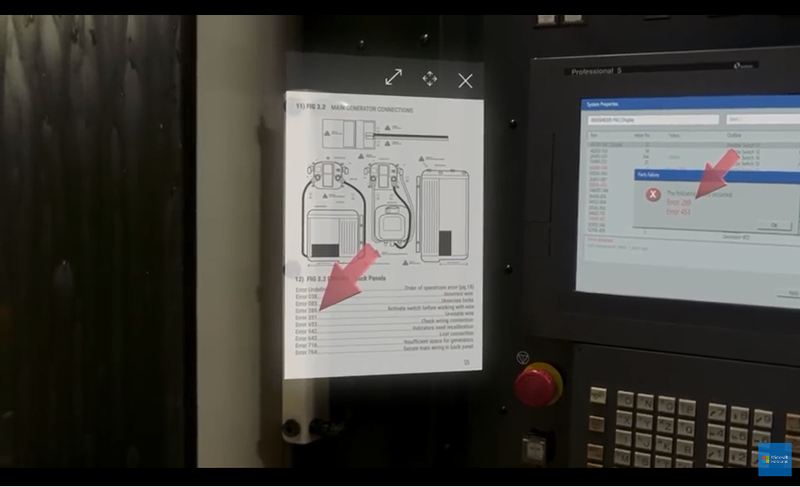 They can also stick images or documents next to the machinery to show you what to do. The fake factory floor was a little contrived, but nevertheless effective in showing how this approach can make it easier to offer support. The alternative in this kind of case is a site visit, which with specialised equipment might well involve a flight and several days delay. The cost is not only the travel expenses, but also the possible extended downtime while machinery is idle. Remote Assist makes this much easier and I can see the potential. HoloLens may seem expensive for a casual purchase, but could soon pay for itself in this context. There is no date yet for availability, but the technology will enter limited preview soon. More info here and in the video below. I also tried Remote Layout, a HoloLens application for designing room layouts. This was less exciting. I was not clear how to achieve the precision you need for a real-world factory layout. Nevertheless, I get the point that overlaying life-size objects onto the real world can reveal issues that you might well miss with just a drawing. Finally, I tried a super-secret demo that I am not allowed to tell you about. Yet. Which .NET framework for Windows: UWP, WPF or Windows Forms? Is high-resolution audio (like SACD) audibly better than than CD? Microsoft Planner: a good task management solution for small teams? Progressive Delivery: the next step in DevOps?